Potholes on I-75 near between 13 Mile and Crooks, especially northbound, continue to create lane closures with the latest happening Monday morning. M-DOT says the closures will likely continue with the deep freeze happening this week and a warm-up expected this weekend. 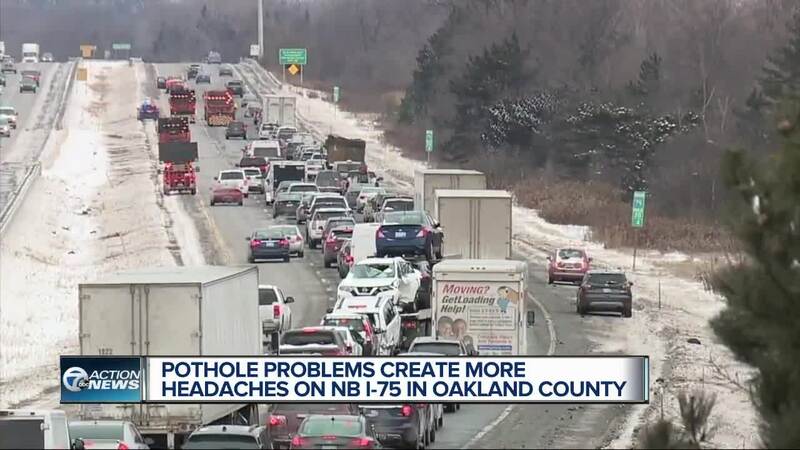 TROY, Mich. (WXYZ) — Potholes on I-75 near between 13 Mile and Crooks, especially northbound, continue to create lane closures with the latest happening Monday morning. M-DOT says the closures will likely continue with the deep freeze happening this week and a warm-up expected this weekend. “Unfortunately I-75 is in very rough shape,” said Diane Cross, spokesperson for M-DOT. Cross says that stretch of I-75 is at the end of it’s lifespan. That - paired with the extreme cold and warm-ups - is to blame for potholes. “Normally we don’t have this kind of freeze thaw factor until like March, when that’s the normal pothole season,” said Cross. Cross says M-DOT crews will monitor the roads once the weather warms up after the arctic bast Wednesday and Thursday. They will travel along the roads, and watch on cameras. If a pothole is spotted, they will make temporary repairs when needed. Construction on I-75 northbound is planned, but not until April when the weather warms up. Until then, drivers might want to avoid I-75 - if possible. “There’s some other roads we can take of course it makes our commute longer,” said driver Kelly Savard.